Instagram Nametags and Digital Marketing | Paladin Worldwide - PALADIN WORLDWIDE MANAGEMENT, INC.
It’s easy to miss new features when social media sites are continually releasing updates. One that is particularly interesting is the Instagram Nametags function. If you are familiar with SnapCodes from the Snapchat platform, this is similar. It was launched in October, 2018 and allows users to scan and follow their friends with a single click. Here is an example of how it works: friend 1 meets friend 2, friend 1 wants to follow friend 2 on Instagram, so friend 2 opens Instagram and navigates to their nametag. Friend 1 then scans the nametag and is able to conveniently follow them at that moment. The benefit of having this function is that it reduces awkward typing in the search bar of Instagram when people or businesses are trying to find each other. How this effects business is within the store. If you are planning a large event that will attract new customers, having Instagram Nametags by the register would be a great way to increase more followers and aid your digital and social media marketing strategy. Of course, you could also pair the Nametag function with in store discounts as well for a maximized strategy. 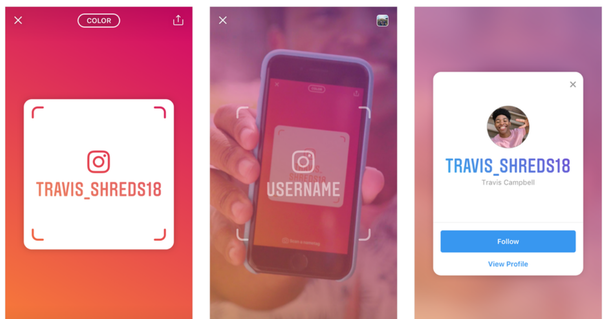 Instagram also incorporated this into their stories section, but you can learn more about using nametags in order to boost your Instagram and digital marketing techniques here.